I just ran to the yard sale down the street. 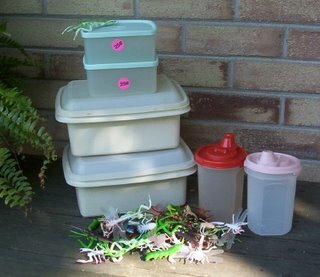 I paid 25 cents apiece for the Tupperware lidded containers, and 5 cents each for the 15 oz spouted ones. (Does anyone know exactly what they're used for? Salad dressings?) Pretty soon I will have a whole kitchen full of bulk items stored in Tupperware, just as I read Emilie Barnes organized hers. 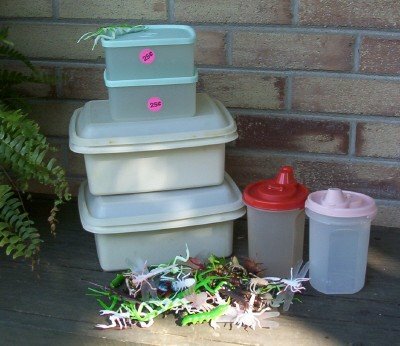 The owner also threw in a huge bag of realistic insects for a nickel. Won't these be fun crawling all over a platter of chocolate cupcakes? Sterilized first, of course! My son scavenged the couch cushions before leaving and spent his 25 cents on 5 nickel toys. She had so many, I'm thinking of sending my husband to pick out a selection for post-baby surprises for Andrew. Cheaper than a Happy Meal! Yeah, I went to one today where they were asking four dollars apiece for tupperware! But I've been hitting a lot of overpriced ones lately. I go to my share of high-priced yard sales, too. I call it the Ebay effect: between that and Antique Roadshow, people are convinced that their junk is worth more than you think it is. Still--there always seem to be a few odd-priced items I can find. That's one reason I like church yard sales best. When more objective (or very busy) people are tagging the items, the more low prices I see! Spouted Tupperware are kids' sippy cups. Great buys. Does anyone else find that when they store noodles and such in tuppereware that when they later open the container they notice a distinct plastic smell? I store lots in tupperware but have found I like powdered milk stored much better in glass. Seems to keep even longer. I have a Food Saver too I use for some things. Great finds Meredith! Alex, I store my powdered milk in plastic, and I have never noticed that. The thing I use is not tupperware, it is just some cheap-o off brand from Wal-Mart. I noticed that with my pasta, and so now leave them in the original bag (open) - which isn't a good choice either. You know, I'm not sure these are sippy cups. They hold 15 ounces apiece and the spouts have flip-top lids. They don't look like sippy cups to me either. I know I've seen them before. But not sure where. They are too big for salad dressing, i think. I have used the spouted containers for sugar and the dry type of creamer, and keep them near our coffee supplies. They can also be used for spices, etc, that are bulkier and bigger, or for something like salt, etc, that you keep in your pantry and use for cooking. The pour spout makes it easier to use, and it flips open with just one hand.